In Italy, procedures of application in medical residency have been deeply re-elaborated in the last four years. Until 2013, in order to pursue their own careers, young graduate doctors had to choose the University and the affiliated healthcare facility where they wanted to specialize, and take an entree exam there in these structures, through a local competition. 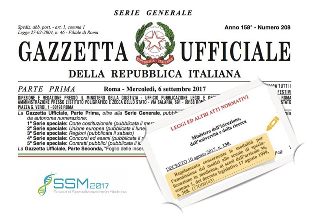 A first fundamental reform took place in 2014, when the introduction of a national competition replaced the hundreds of exams in the different Italian universities. Therefore, candidates were asked to individually choose up to six different branches of medicine, as well as to locate some preferred facilities; after the competition, the Ministry of Education, University and Research (MIUR) issued several national rankings, one for each medical specialization. The examination consisted of a multiple-choice test subdivided into a first general part identical for all, a second one based on three different macro-areas (medical area, surgical area, and area of health services), and a final ten-question test specific to different branches. In the following two years, residency access competitions remained almost unchanged. Yet, the 2017 edition, albeit being structured along the lines of the previous ones, has been developed following a new regulation adopted by the MIUR on September 6th, with the purpose of streamlining and making the test procedures more transparent. Moreover, access to the different Schools of Specialization is now regulated by an annual national multiple-choice test. This test is the same for all students throughout the country, and it consists of 140 questions about key topics related to Medical School’s programmes, as well as some questions more specific to all the different medical branches. A single national ranking including all the participants is then drafted based on the test’s scores. Starting from top of the list, each participant doctor who won a place as a resident is contacted in order to let him choose and declare both the preferred school of specialization and the selected city facilities. Each doctor is given the possibility of choosing up to three different kind of residencies, in order of preference. The achievement of high test scores allows to get a good ranking. The final score is calculated by summing the number of correct answers (that are worth 1 point each, while each wrong answer means losing 0.25 a point) to “extra-test” points, represented by University curriculum, which weighs definitely less than it used to in the previous tests ; in fact, now it is less than 7 points – rather than 15 – consisting of: up to 2 points for the degree grade, up to 3 points assigned after the weighted average of university exams’ grades, 0.5 a point per an experimental graduation thesis, and 1.5 points for a previous Ph.D.
Each annual edition of this new modality of residency access has to be specifically addressed by a competition notice published around the month of May. In conclusion, this new national test was held last November, and, starting from December 4th, the awarded candidate doctors were able to choose the preferred available facilities, in a batch process depending on their score and rank position. The last residents’ allocation was held on December 22nd. To those who have just started their training activities, all that remains for us to do is to wish you good luck, or if you prefer, buona fortuna!